I recently took delivery of a Lenovo Yoga 300, the lower-end model of their impressive convertible line. This otherwise perfectly usable Laptop with 4GB RAM and a Celeron N2840 chip unfortunately ships with a traditional WD Blue hard drive (at the time of writing) and it’s noticeable. With a slower processor, the least I could do to alleviate some of that performance bottleneck is swap the HDD out with a nice, speedy SSD. The reason I’m documenting this is due to the lack of information online. 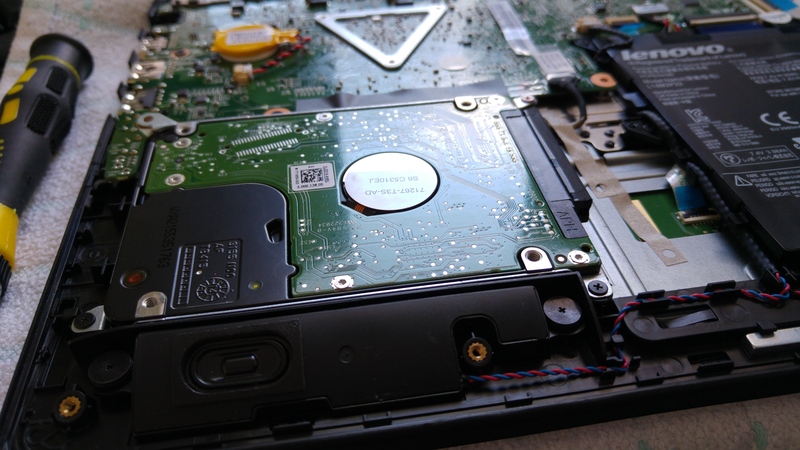 I ended up following the official service manual supplied by Lenovo which still leaves a little to be desired, though allowed me to get the job done. 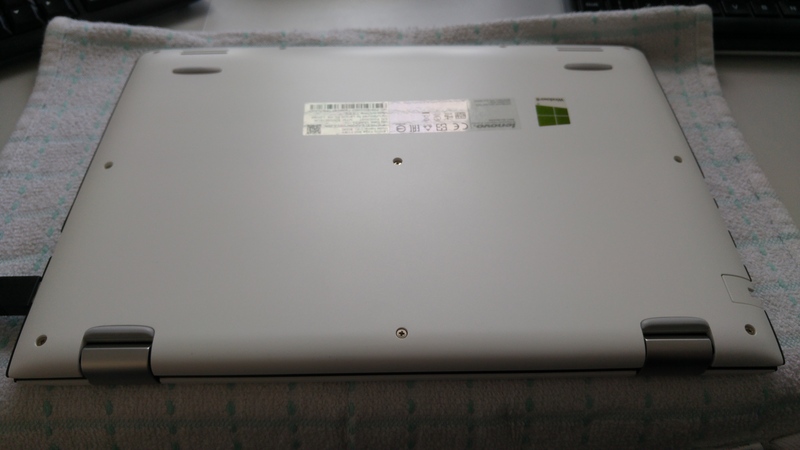 Lenovo have used a combination of M2 screws and plastic clips to secure the bottom panel to the laptop chassis. While the screws come out with ease, the plastic clips take a little more persuasion. Remove all screws. These are 6.5 M2’s and a suitable screwdriver should be used. NB: The 4 screws at the front are angled slightly. Not an issue now, but bare this in mind later. Start by lifting the corners at the hinges first. These should pop up with ease, so don’t lift too forcefully. Gently pry the bottom panel away from the chassis between the hinges. This will require a little more effort and will ‘pop’ 3-4 times. As the bottom panel is quite tight to the sides of the chassis, gently pull upwards between the hinges, this will effectively lever the panel clips ever so slightly away from the sides of the frame, requiring very little effort to then pull the sides up either with fingernails or a spudger. Once both sides are up, the front of the panel will still be securely fastened using slightly different clips. I found the best way of releasing them was to take a firm hold of one of the corners, pull away from the front of the chassis and down while levering against a spudger or finger placed close to the front corner (on the same side, naturally). This should effectively pull the panel away from the chassis and up, resulting in a satisfying pop as it releases. Repeat this pulling motion while gently manipulating the front of the panel. It will become increasingly easier to pop the remaining clips as each releases. 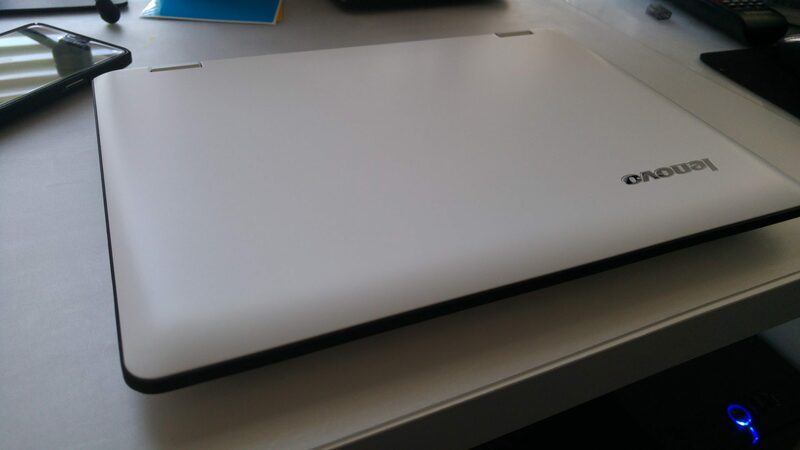 With the front of the laptop facing you, the hard drive is easily accessible on the left. Remove the 3 4mm M2 screws using a suitable (different) screwdriver. My model used three to secure the hard drive on the bottom left, right and top right as pictured. 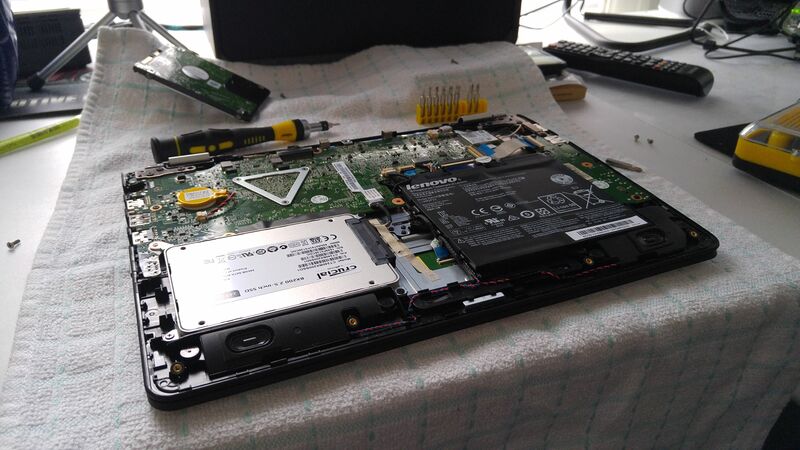 Once free, remove the hard drive from the chassis and put the laptop to one side. The hard drive has a metal adapter screwed on to each side, transfer these to the new SSD making sure to match orientation of the plates when doing so. At this stage the old hard drive should be out and the new SSD in, all that remains is to reassemble the device in reverse order. When refitting the bottom panel, do so in the reverse of the way it was removed; fit the front first and lever the panel down. It will likely require some gentle persuasion to slot back into the sides. Gently click the plastic tabs back into place from front to back. The front will require a little more force but not much. Remember the back corners will not clip (so don’t force them), but between the hinges will. Screw the bottom panel down loosely, double checking all plastic clips have clipped before fully tightening the screws. Remember the front screws are at a slight angle, be aware of this and don’t cross-thread the screws! Or actually, before you do, flip the laptop the right side up and give it a gentle shake. If there’s nothing rattling about you’ve done a good job. While you’re at it, test the volume rocker on the side to ensure it’s still “clicky” and hasn’t been fouled by the case. Enjoy the added benefits of an SSD and if you need any assistance leave a comment below or @jasonbayton on twitter.